Mystery surrounds the whereabouts of a R3 million video that Mpumalanga Premier David Mabuza’s office paid for using taxpayer’s money as part of the province’s R70 million memorial services for late former President Nelson Mandela. According to information that Ziwaphi has seen, Mabuza’s office paid more than R3 million to Carol Bouwer Productions in December 2013 for the production of the memorial video. However, the premier’s office has been at pains to explain whether the video exists or not. “They are still editing it,” said premier’s spokesperson, Zibonele Mncwango, in March 2015, when Ziwaphi lodged its first media enquiry on the mysterious video. Over the past year, Mncwango has failed to respond to subsequent media requests to prove that the video exists. He eventually referred all enquiries to the newly appointed provincial Director-General (DG), Thulani Mdakane, who was singing a different tune. “When Mr Zibonele made the comment that they were still editing the video for the memorial service, it was on the basis of information that he had been given by the former DG (Dr Nonhlanhla Mkhize). He (Mncwango) had not personally seen the video,” said Mdakane. Mkhize, the province’s former DG, had been seconded from the national department of women, children and persons with disabilities in 2012. 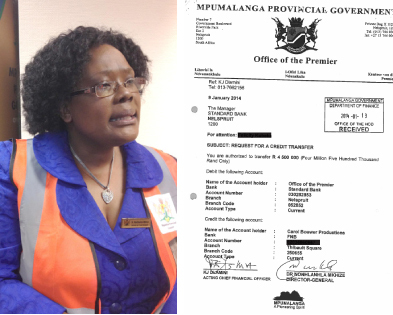 She left the provincial government before the end of her contract while Mpumalanga Premier Mabuza was on sick leave last year. On February 13 this year, Mdakane promised to institute an investigation within a week of the information being brought to his attention. “I will engage with the internal finance and audit (units) to investigate the matter, because the person who was working on the project is still in the employ of the office of the premier,” said Mdakane. He said that he would also need Mkhize’s co-operation. Two months later, however, Mdakane has been ducking questions from Ziwaphi. At the time of going to press, Carol Bouwer Productions had not responded to written questions while Mkhize’s contact number only contains a voice message that it does not exist.